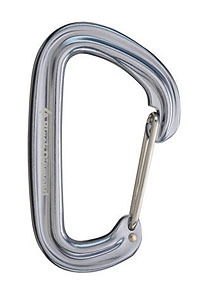 The NEUTRINO is a lean, mean all purpose alternative to the bulk and weight of standard biners. 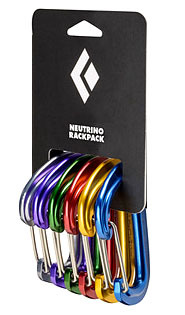 Slightly shorter (3.5" overall) the NEUTRINO takes up a minimum of space on your rack, yet retains features important to all rock, wall and alpine climbers - a wide 22 mm gate swing, super supportive 9.4 mm rope bearing surface and an easy clipping low profile nose. Without sacraficing anything but weight (a rack of 40 checks in at a scant 3 lbs) the NEUTRINO will do you proud on any route. Now available as the RACKPACK - in 6 anodised colors to match your BD cams. 22 kN Made in USA.